To some people, opossums can be among the cutest creatures in the whole world. To others, an opossum’s long face is enough to scare them away. No matter what you may think of opossums, they can wreak havoc on your garage, especially in the winter. 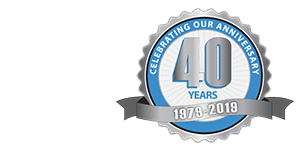 To have peace of mind during this bitter cold season in the Chicago area and the DuPage County suburbs, it is best to follow some precautions so that you do not have to deal with the challenges that come with harboring furry creatures in your garage. By the way, “opossum” is the correct spelling when referring to the North American marsupial, but many people refer to them as “possums” or use the two terms interchangeably. We will use “opossum” for the purposes of this blog. How Can Opossums Destroy Your Garage? Opossums can make frequent visits to a homeowner’s garden, compost piles, garbage bins, and food dishes for dogs and/or cats. If there is an opening in the home that has gone undetected, then an opossum can make its way into the home to search for food or to find shelter. Opossums often leave droppings and excretions on solid ground, potentially causing some serious damage to your garage. If they bring leftover food from your compost pile into your garage, then the food will rot. The excretions from the opossum will often attract parasites and can cause bacteria to form inside the garage, causing damage to the interior of the garage and any property inside. How Can Opossums Make You Sick? Even though opossums almost never carry rabies, they can carry other diseases, including tuberculosis, Chagas Disease, salmonella, and tularemia, to name a few. These diseases can be extremely serious if not controlled immediately. Opossums also often carry fleas, mites, and lice, which can be transmitted to people in the house. One way to keep opossums at bay is to simply remove all food sources in your yard and near your garage. Using trash cans and bins with tightly fitting lids will ensure that opossums do not have access to any food sources in your trash. Another way to remove opossums from your premises is to close off any holes that might be in your home. This includes your shed, porch, and any undetected burrows that could be in and around your garage. It is also a good idea to invest in some chicken wire to close off any opportunities for opossums to enter your home. To do this effectively, you will need to bury the fencing six inches or more in dirt so opossums cannot just dig underneath the wire. Using a repellent is another good strategy to keep opossums at bay. You can also put crushed garlic in places where you think opossums would like to hang out. Opossums are opposed to the smell of garlic and will avoid areas with that scent. Ammonia also makes a good repellent; simply pour some ammonia in a coffee can and place an old towel inside the can to help disperse the fumes and scare the opossums off. Afterwards, throw some mothballs in the burrow to make sure the opossum will never come back. The fall weather has been very crisp and delightful so far, and we want to keep this season that way. 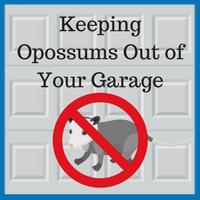 It is best to take precautions to keep opossums out of your garage by following the simple steps listed above. No one wants to get sick as a result of having opossums in their garage, and nobody wants to have to repair damages to their garage caused by opossums. If you have any further questions about how to keep opossums away from your garage, please contact us at 630-852-8485. To check out our work, please visit our gallery.